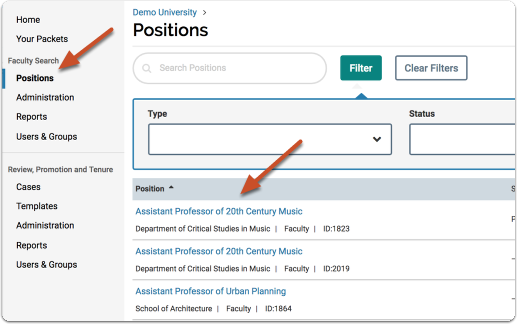 Interfolio Faculty Search keeps an automatic log of the user actions and events that take place around each position in the program on the position activity log. The position activity log for any given position is visible only to users with Administrator rights over that position (admins and committee managers). It is separate from the existing system logs under Reports. These logs provide you with a clear record of when certain changes were made and by whom. Click the "Position Actions" button at the top right of the applications page of the position, and select "View position activity log"
The user will see a log with entries indicating changes or activity. This list of events can be searched and sorted by date or event. A link to “View Message” concerning the event will appear where applicable. 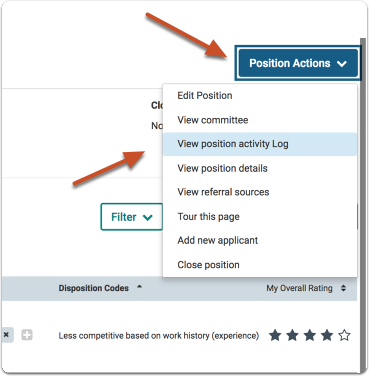 You can access the position activity log from within the individual position. Currently, position activity log data is just for the individual position, and not available in aggregate (such as through Reports). Position Status Changes: Text: [First Name] [Last Name] [(E-mail address)] updated the position status from [Old Status Value] to [New Status Value]. Committee additions: (only ad-hoc additions here) Text: user_name (user_email) added user_name (user_email) as a committee member for this position. Committee Removals: Text: user_name (user_email) removed user_name (user_email) as a committee member for this position. Position Workflow step change when the position is sent forward (approved) or backward (rejected): Text: approver_name (approver_email) moved the position from Step X of Y: step-name to Step Z of Y: step-name. Position published: Text: If a user published: user_name (user_email) published the position. If interfolio auto-published, we should say: Interfolio automatically published the position. Position Open Date: Text: This position is open and accepting new applications. Position Close Date: Text: The close date for this position has passed, and the position is no longer accepting new applications.